The Eliminator Lighting LED Fury offers a new take on a classic effect that has been around the lighting business since the beginning. 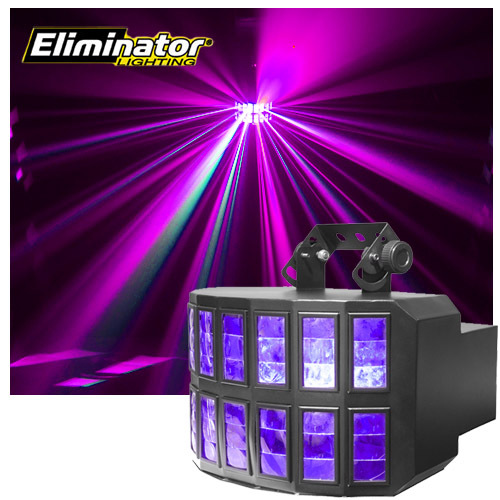 Equipped with 1x RGBWA LED rated @ 8W the LED Fury's crisscross effect projects powerful and sharp beams that cover a wide area room or dance floor; whether used at a club or for a mobile DJ it will not disappoint. Offers 3 function modes: Sound Active, Master/Slave or DMX, Electronic sound sensitivity control and strobe effect. 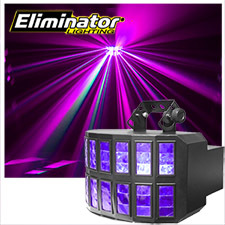 Best part of all with incorporated LED technology you'll no longer be emitting heat onto the stage or entertainer and therefor will run all night long without requiring a duty cycle.